Jonathan was born in Los Angeles and grew up in Northern California, Southern California and a few year stint as a teenager on the coast of Mexico with his roots. Strongly influenced by the work ethic of his grandfather “become an asset wherever you work” he taught him, living in Mexico humbled this kid who tore up his toys and tried putting them back together, sometimes successively! Prior employment includes installing audio equipment in vehicles, security, video, and integration. 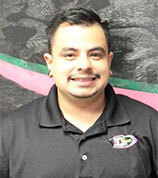 Jonathan’s goal is to keep training his way up to be a top technician and eventually run a store of his own. In Jonathan’s spare time he likes to mess with his car and he’s always finding a project to keep him busy. In Jonathan’s other spare time he likes to go on long scenic car drives.